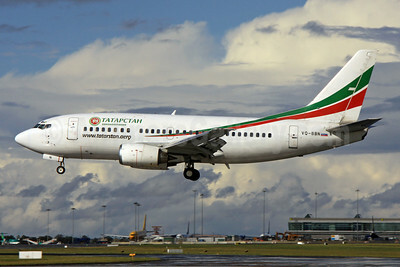 Tatarstan Aircompany (Tatarstan Airlines) (Kazan, Tatarstan, Russia) flight U9 363 with Boeing 737-53A VQ-BBN (msn 24785) crashed on landing at Kazan today (November 17) in Russia. The aircraft with 44 passengers and six crew members burst into flames, tragically killing all on board. The flight had arrived on a flight from Moscow (Domodedovo). The crash occurred on landing at 19:25 ( GMT). Update: A dramatic new security camera video shows the Boeing 737-500 diving straight into the ground which would explain the lack of survivors in this “landing” accident. Copyright Photo: Paul Doyle/AirlinersGallery.com. Boeing 737-53A VQ-BBN arrives at Dublin before the tragic crash. This entry was posted in Tatarstan Aircompany and tagged 24785, 737, 737-500, 737-53A, Airplane Crash, Boeing, Boeing 737, Boeing 737-500, Crash, Kazan, Plane Crash, Russia, Tatarstan, Tatarstan Aircompany, Tatarstan Airlines, VQ-BBN on November 17, 2013 by Bruce Drum.